Madasa is alive with memories and, like the Dead Sea below, with tourists. Masada - Hebrew for fortress - is of symbolic importance to contemporary Jews and for all of humankind as a vivid reminder of man's struggle for freedom. It's also one heckuva big rock. Tip: You can climb up - and there are those who do - but save yourself for the top and take the cable car. There's a model in the Visitor Center of what it once looked like and where guides will orient you but it won't mean much until you actually get on top.You'll spend an hour or two there so use the bathroom facilities here first. 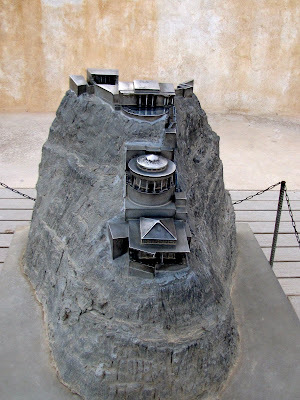 Model of King Herod's palace complex atop Masada. The complex atop what we would call a mesa were originally built by King Herod the Great as both a summer palace and a refuge in case the Jews got out of hand or Cleopatra actively pursued her desire to add Judea to the Egyptian empire. His palace literally "hung" off the northern side in three stepped tiers. There was a large reception hall in the middle of the mesa plus baths, an administrative complex, garrisons and elaborate storage for food and water. You can tell a King Herod era building by its unique "framed" blocks. The ramp for the battering ram. After Herod's death, a group of zealots during the Jewish uprising surprised the small number of troops remaining and took over Masada. With travel pal Carol Timblin in the synagogue. Anything below the dark line is original, above it reconstruction. With the fall of Jerusalem and the destruction of the Temple, many more joined them until the population numbered some 1,000 men, women and children. When Judea fell under direct Roman rule it was decided to get rid of these resisters. Roman legions with thousands of prisoners of war, circled the fortress with walls and built a massive ramp on the western side via which a battering ram was moved up to end the siege. You can still see the squares of Roman encampments that surrounded Masada during the siege. According to legend, knowing their days were numbered, the 960 remaining Jews voted to take their own lives rather than submit to their fate under the Romans, death or slavery for all. This they did May 2, 73. Ten were selected by lot to be the last who would kill one another, torch the city and finally, commit suicide. They purposely left food and water stocks untouched to prove their actions were not the result of hunger or thirst. One-tenth of the cistern complex. The only written account of all this is suspect as its author, Flavius Josephus, a first century CE historian. He grew up as the son of the high priest and leader of the Jewish rebellion, but conveniently dropped his Jewish heritage, changed his name and became a Roman. He claimed the story was told by two females and a child who escaped rather than die. Forty years later, Masada was abandoned and forgotten until rediscovered in the 1960s when excavations began. Walking along the top of Masada. Tip: You'll encounter 24 steps with a landing in between to reach the top but once there walking across the site is fairly easy with paths and 15 steps to Herod's palace. Even off path it's not bad. The Dead Sea from Masada. The Dead Sea closer up. Saltier in the north - 34 percent - than in the south - 12 percent. • drink it - tastes bitter and its high magnesium content will kill you! After hearing all of those warnings and feeling the cold air of January it took a lot of curiosity to make the plunge. However, it's one of those once in a lifetime things and you shouldn't miss it. Bathhouse on left, path to the sea on the right. Tip: You'll have a bit of a hike from bathhouse to sea. Watch out for the rocks of salt deposits - they're cuttingly sharp. The feeling is eerie as you are lifted by the water. Naturally, you lean back to float and that's where the trouble begins. The water is so buoyant, you can't get your torso up and feet down to stand! I'll add "Don't go in alone" to the warnings. There will be opportunities for the traditional Dead Sea mud bath but I passed on that, preferring to buy mine from a tube. I do like the Dead Sea skin products, though. Jerusalem is full. Of history, religion and factions who think it should be theirs alone. 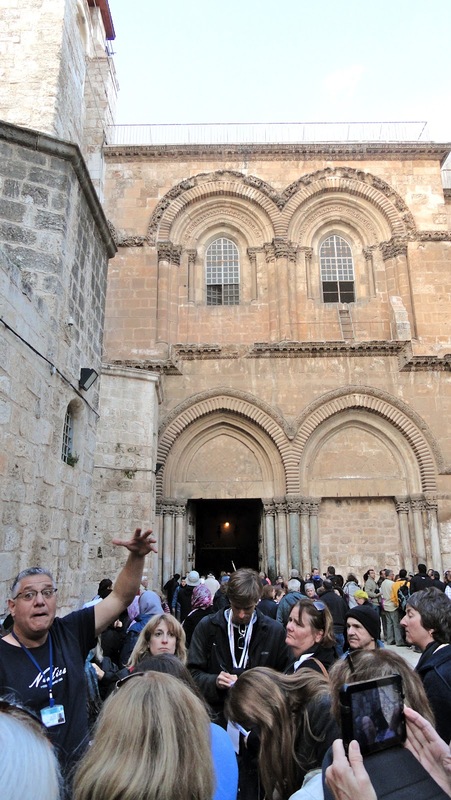 Of tourists and pilgrims, preachers, priests, rabbis and imams, Arabs and Jews, tour buses, trucks and cars. It is a 10-ring circus, a microcosm of what is good and bad in the world and from its inception, a potential powder keg. Also, exhausting and annoying. There is never enough time, enough room, enough energy. Tip: It is a challenge for Levelers. The feet, hooves, wheels and seismic shifts of ages have ensured no level surfaces. Hills abound as do steps and you are at 2,500-3,500 feet above sea level. Bring a balance aid, prioritize and take your time. You can do it a little bit at a time. I only had a day but highly recommend scheduling 3 to 5 depending on how important the historic and religious sites are to you. Just remember, it would take a lifetime to fully absorb this city. I will walk you through a few of the highlights. Get your bearings at the Mount of Olives. Start high to get your bearings of the city, especially the old city. Stand at the parapet in front of the Church of all Nations. Pat of the Christian cemetery. 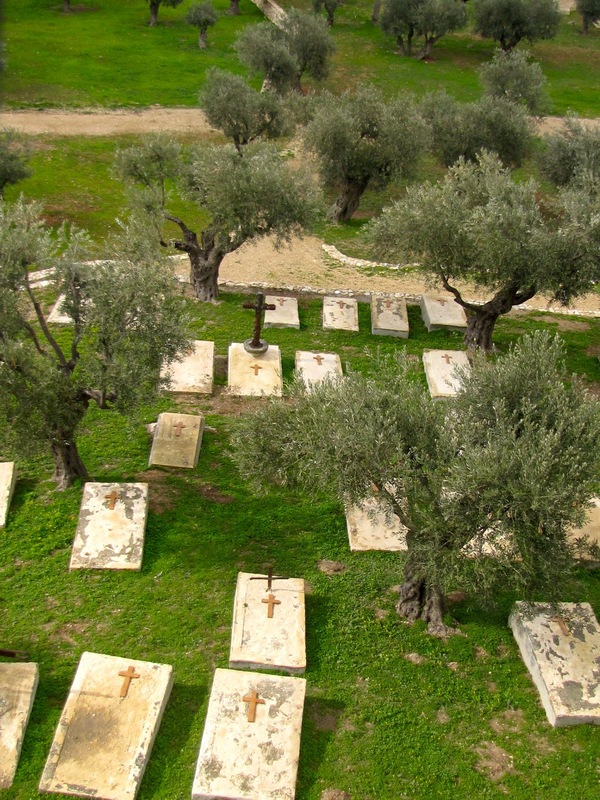 Below are Jewish, Christian and Muslim cemeteries in the Kidron Valley, one of the city's most sacred sites. Each religion believes that this is the spot where the end times begin so naturally, all want to be at the head of the line. Ahead inside the old city walls is the gleaming Dome of the Rock on the Temple Mount and adjacent is the Al Aqsa Mosque. Only Muslims are allowed inside. In back, beyond the wall, is the Tower of David. The gray dome is the Church of the Holy Sepulcher. To the far left outside the Dung Gate is where the Palace of David once stood. The old city is divided into quarters: clockwise from bottom left, Jewish, Armenian, Christian and Muslim. Warning: You will be doing the Old City on foot, but you will be inspired by other pilgrims, many in much worse physical shape. If they can, so can you. The "new" city is truly new; the first settlement beyond the walls wasn't made until 1860. Church of all Nations, Church of Gethsemane, Church of Agony are three names for the church built on the spot and around the rock where Jesus laid his head in the Garden of Gethsemane and also where he was captured. For once, this location probably is the location. The oldest olive trees in all of Jerusalem. This is the latest church on the site and as you face it, enter from the back left. Head up the sidewalk, go right through a gate and continue along the walk that goes through the oldest olive grove in Israel. Tip: Public restrooms are to the left at the end of the street up to the side entrance. The door is designed as an olive tree. 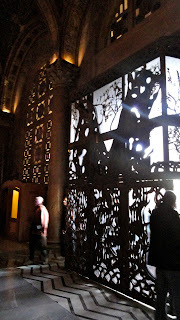 Inside, the church is dark to put visitors into the agony of that night. Glass panels let you look down into the Byzantine church below but most important is the rock itself. The rock upon which Jesus is said to have rested is surrounded by continuous crowns of thorns. The grove, the church and especially the devout who kneel in prayer, are quite moving. Tip: You exit through the front door. There are 14 shallow steps down to street/bus level. The Crucifiction is said to have occurred on the mount as well. We entered through the Dung Gate. Like the other eight gates in use, there are three arched portals: one for entering, one for exiting and the middle one for the military to control both directions. The ninth gate, the Mercy (Golden) Gate is closed until as the Jews believe, the Messiah enters or, as the Muslims believe, the just will pass on Judgement Day. 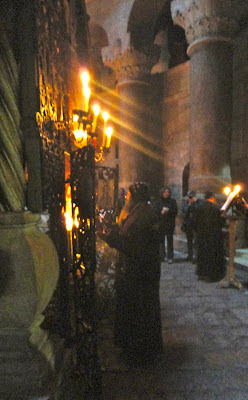 Christians believe it is the gate through which Christ entered the city. The current walls were built by the Ottoman sultan Suleiman the Magnificent between 1535 and 1541 on the site of walls from the time of King Herod. It's the closest thing left to the Temple where the spirit of God lives, according to Jewish dogma. It's really just a retaining wall further shored up by Suleiman's builders, but Solomon's original temple could not receive more veneration. You, too, may be affected, especially by the devotion of the women, whose side is much smaller than the men's and who seem to be much more genuine in their prayers. Anyone is welcome to leave a message scrunched in one of its cracks and according to our guide, you can now fax or email a message to be placed there! This allegedly is the path down which Jesus was forced to carry his cross en route to Golgotha. It winds throughout the old city and its 12 stops are marked with plaques. We traveled about half of it between the Church of the Holy Sepulcher and the Jaffa Gate where we exited the old city. Tip: It can be physically challenging at times but if you take it slow, it's doable. Groups can be intimidating outside the church. Protestants believe the Garden Tomb is outside the Damascus Gate but Roman Catholics and Greek Orthodox believe this is the spot where Jesus was buried. As you can imagine, there is much pomp and circumstance here, crowds of milling pilgrims and tourists, venders and guides. Inside one of the many chapels. Inside, the church is dim, dense with people and incense, glittery with gold, silver, crystal and brass. 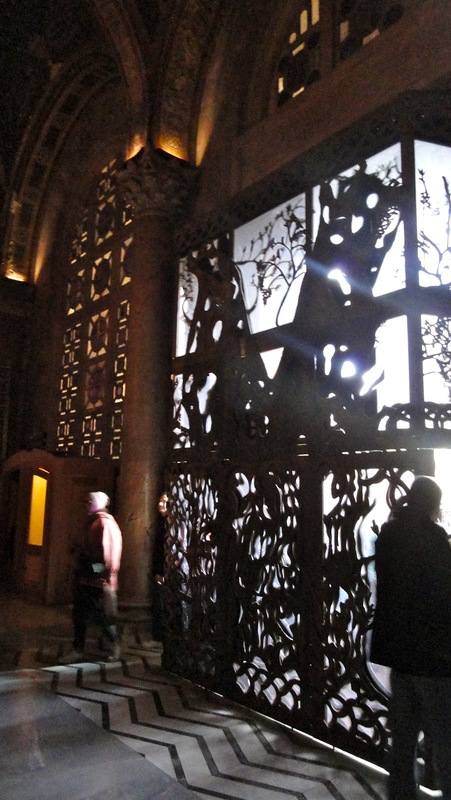 Individual chapels, many of them dating back to the Crusader era, break up any semblance of "flow". Look inside the grotto where the true cross was supposedly found. in 362 A.D., when Constantine sent his mother, Helene (later Ste. Helena), to Jerusalem to follow up on a vision he had experienced, this is where the remains of the Temple of Venus stood. She was given a tour of the city's holy sites and told this was where the Crucifiction occurred. After prayer, she had the site razed and after some digging, supposedly found the true cross buried underneath. One of the big debates is which chapel is the site of Jesus' entombment? The generally accepted one is rich with embellishment and constantly prayed in and venerated. 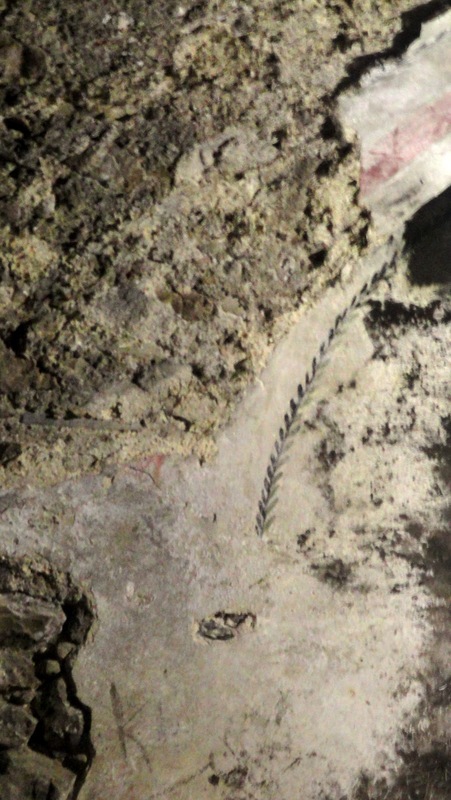 The grotto where the true cross is said to have been found is also near a ground burial cave that many believe to be the entombment site. Or here where the only decoration is a simple row of stylized olive leaves? 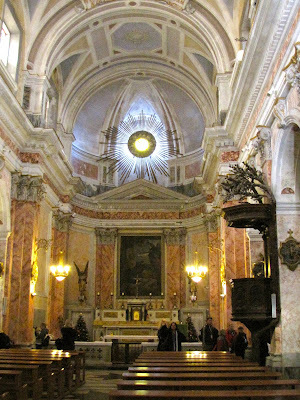 Tip: Okay, here's the stair count: 18 very steep steps up to the place of Crucifiction, 60-70 steps to where Helena is said to have found the cross and one to three-step combos throughout the church as you go from one chapel to another. The bad news: Light is minimal and it is easy to stumble. The good news: You'll be accompanied by so many other people you are more likely to hit one of them than the ground. Everyday life is the best show of all. The old city is full of winding corridors and nooks, souks and markets, fascinating-looking characters. When you tire - and you will - pick a spot to stop and watch the passing show. The walk to the Shrine of the Book. 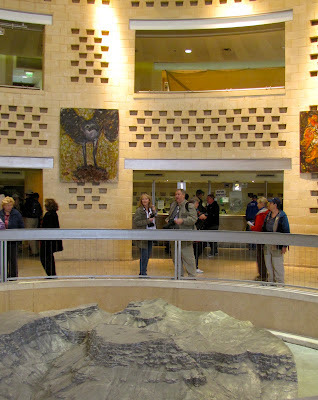 This repository of the Dead Sea Scrolls, on everyone's must-see list, is outwardly impressive, but after hiking around the old city, the 23-acre campus was daunting. Just as well because our time was extremely limited. Tip: There is elevator access directly from the reception area to the Shrine of the Book. Unless you take the elevator, you will walk through the entrance area and around, down a series of easy steps. You will also see lots of steps if you want to reach what are supposed to be superb collections in the other buildings. Scale model of Jerusalem during the Second Temple period. The shrine itself is visually striking, its top resembling the finial caps at the ends of scrolls. Adjacent to the building and on a rise overlooking the city is a fascinating 1:50 scale model of Jerusalem in the second Temple period and the shrine itself is quite striking. Warning: After walking down 12 steps, the interior is exceptionally dark, both for effect and to protect the precious sections of the scrolls which are arrayed in the circular room behind glass. However, those displayed are copies, not the originals, which makes the whole protection bit moot. Steps abound, none of them lit and several in our group tripped. Definite hazards. I would like to return but if I do it will be early in the day when legs and knees are fresh. Tel Aviv's seaside from Jaffa. 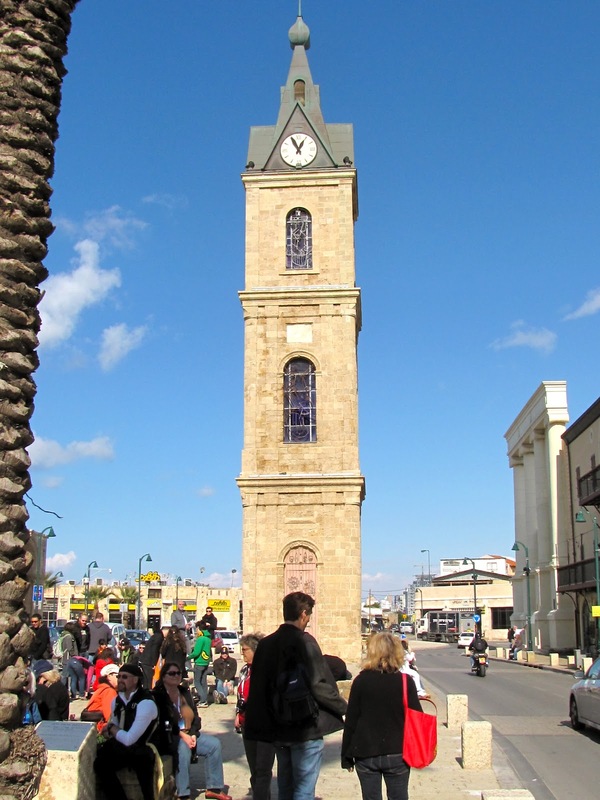 TelAviv and Jaffa may be one city now but one is barely 53 years old, the other is more than 4,500, so old it was supposedly named after Noah's son Japheth. Tel Aviv is to Israel what San Francisco is to America: urbane and open, a center of enlightened thought, creativity and cutting edge attitudes by the sea. It embodies what the new Israel could be, much to the chagrin of ultra conservative factions. Creativity comes in all forms in Tel Aviv. If ever a barbecue or shrimp restaurant opens it will be here. For all I know there may be one already. I barely skimmed the surface, but here's what I found worthwhile. Tip: Tel Aviv is a city best seen on foot. Most of it is pretty flat, but if you aren't up to it, hire a car and driver. Rothschild Boulevard, one of Tel Aviv's first streets and still a main thoroughfare, is a good place to start, especially to see the "White City," the world's largest city's concentration of Bauhaus structures. Founding 66 families of Tel Aviv survey their new home in 1909. Don't Miss: Dizengraf House, Independence Hall. Leave Israel's Independence Hall after the presentation without a tear in your eye and you can give lessons to hard-hearted Hannah. This is where 66 families gathered April 11, 1909, to draw for plots of what then were merely sand dunes. To see what resulted from nothing is impressive, but it is the independence part of the story that resonates. Visitors sit where the state of Israel was declared. 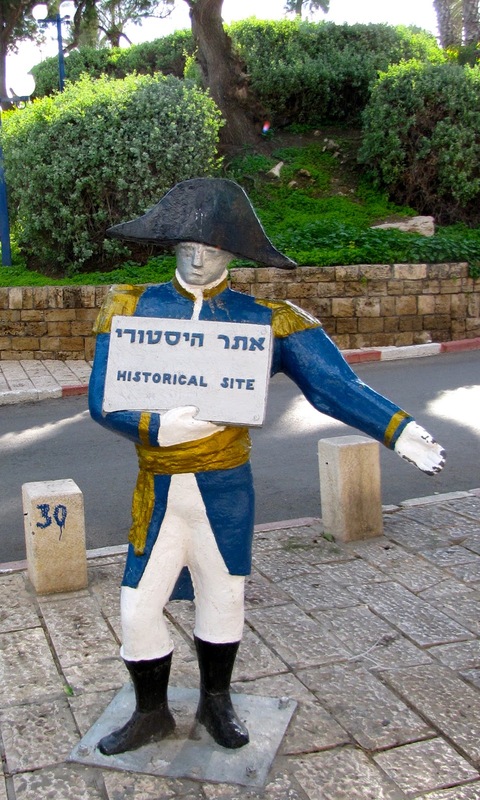 The stirring narrative of the country's founding in the very spot (the house of the city's founder and first mayor) where the Declaration of the State of Israel was made and signed by its first premier, David Ben Gurion, is an experience you will never forget. Tip: Independence Hall is on the first floor; steps minimal. Sheinkin Street is where to party or so I'd been told, but urban renewal had torn up the street. The party had moved elsewhere when I was there in January. Should be back by now. 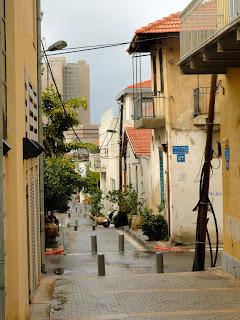 A typical street in Neve Tzedek. 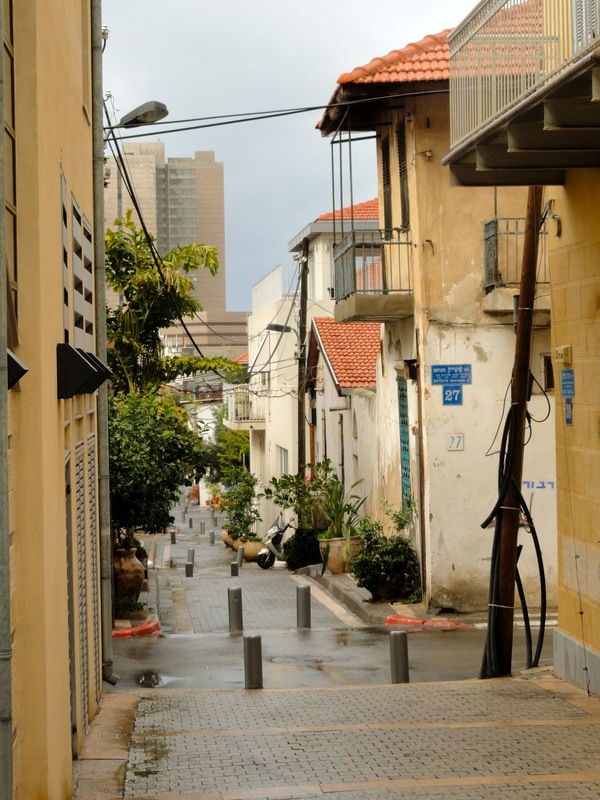 Neve Tzedek, a suburb begun in 1887 for the Jews of Jaffa, is the oldest part of the city. 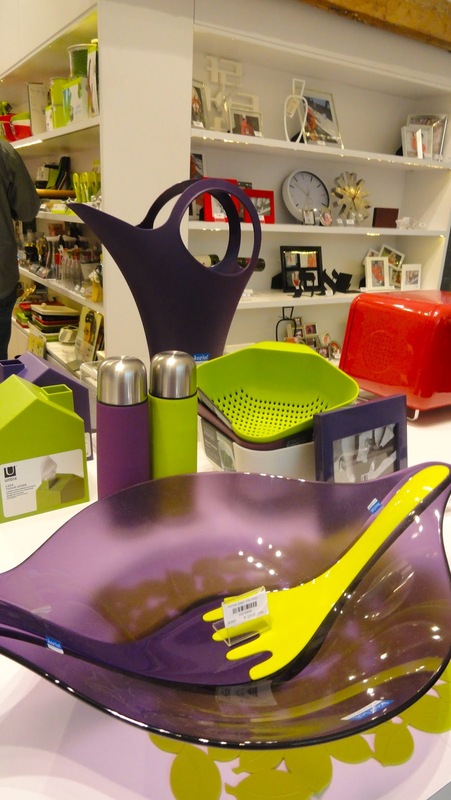 Interesting boutiques and cafes alternate with gracious homes. Suzana, www.rest.co.il/suzana, a popular cafe shaded by a huge ficus tree, produced one of the best meals I had in Israel; vegetarians will love it too. Tachana is much more welcoming when the sun shines. Tachana, formerly a train station, is being turned into a shopping district. It's a work in progress but Soho 100% Design Shop is full of objects - kitchenware, purses, jewelry, deskware - by superb Israeli designers at very reasonable price points. 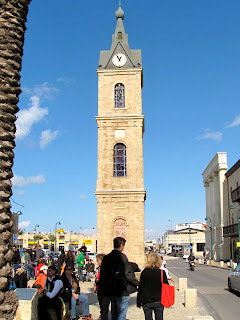 Jaffa is to Israel as St. Augustine is to America, the oldest city. In fact, it's one of the oldest cities and ports in the world, 4,500-plus years old vs. Jerusalem's 3,500. Cedars from Lebanon for Solomon's temple came through the port that Jonah sailed from when he encountered the whale. Later, Peter is said to have experienced a vision from God that prompted him to accept Gentiles into the new Christian church. Look at the elevation of the current port and that of the Mediterranean Sea to get an idea of how many previous cities you are walking on. Old Jaffa's steps are no problem for Levelers with a balance aid. Tip: It's 22 steps down to the oldest port in the world. They are easy but surfaces are uneven. I found my walking stick (see Recommendations, www.travelonthelevel.com) invaluable here and elsewhere throughout the country. The pulpit at St. Peter's is carved as a tree. St. Peter's Church is late 19th century, built atop an earlier Crusader citadel, built atop an earlier church (when you've been conquered 22 times, this happens!) and contains a room where Napoleon is said to have slept in 1799. The pulpit is a glorious piece of carving. The little general destroyed much of Jaffa but was unsuccessful in taking over the area. As tongue-in-cheek revenge, his image has become the "pointer" to various sites of interest. Tip: There are 6 steps down to the chapel and 15 steps down to Napoleon's room, part of the 12th century church. Look down into old Jaffa at Jaffa Tales. Jaffa Tales is a tiny bit hokey but an excellently done multimedia presentation that brings Jaffa's history to life. In the Visitor's Center, it's combined with a small museum that allows you to look down into older layers of the city. 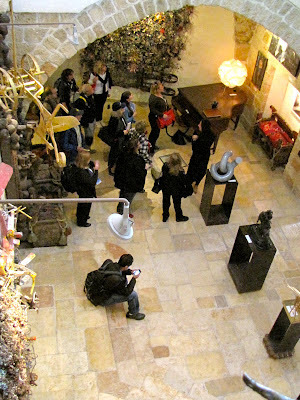 Many levels of interest at Ilana Goor Museum. Ilana Goor Museum is the home of the internationally-known artist and her large collection of art. The structure was originally the first hostel for Jewish pilgrims to the Holy Land. 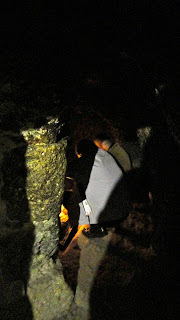 Fascinating, surprising and absorbing, these very personal spaces will stay with you longer than many historical sites. There's a store where, if your pockets are deep, you can pick up a piece or two of her work. The charm and view from Ilana Goor's rooftop is worth the climb. • 18 very tricky spiral steps from the museum's first floor down to the gift shop which you can avoid by going out the front door and walking around to the side. Head for the The Clock Tower, one of 100 erected throughout the Ottoman Empire to commemorate the 25th year of the reign of Sultan Abdul Hamid II. 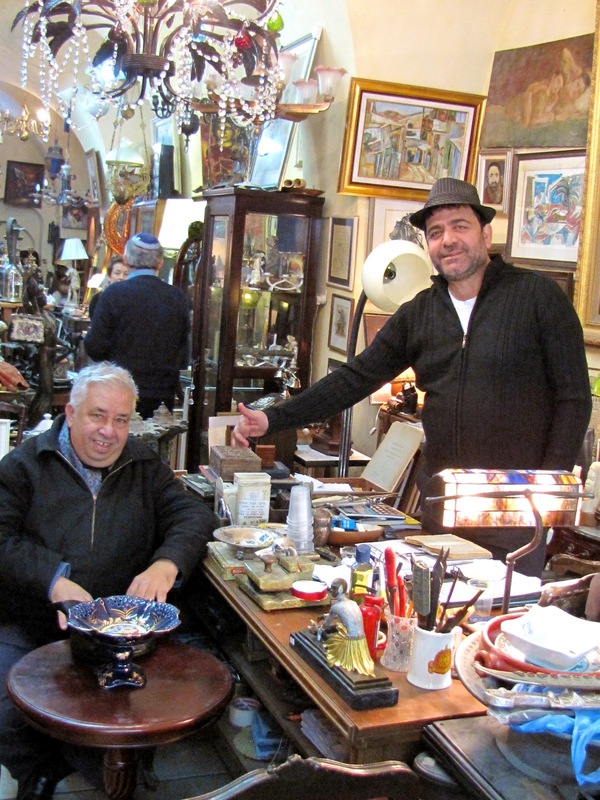 Walking away from the sea and you'll encounter streets of "collectibles" shops and flea markets. Enter a shop, ask a few questions, haggle a bit, whip out a camera and you have new friends like these at Lou Lou.